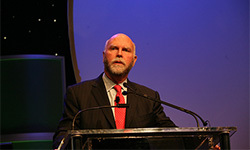 J. Craig Venter, a renowned geneticist and UCSD alumnus, was one of the keynote speakers at last week's BIO 2008 convention in San Diego. At the BIO 2008 convention at the San Diego Convention Center last week, a new biotechnology issue grabbed the headlines, and UC San Diego played a significant role. This year, biofuels were a hot topic—due to soaring gasoline prices, intense interest in sustainable energy and the need for climate change solutions. The annual convention by BIO, the Biotechnology Industry Organization, was attended by about 20,000 people from entrepreneurial companies, large businesses, state and regional biotech associations, research centers, service providers and many biotech organizations representing countries around the world. During a keynote address, Gov. Arnold Schwarzenegger lauded California’s leadership in biotechnology research and business in disease treatment, food production and biology-based fuels that he said will eventually result in “a carbon-free world.” The governor reminded the international audience of California’s leadership in regenerative medicine from Proposition 71, the $3 billion state initiative to fund and advance stem cell research to create breakthrough cures. Experts connected to UC San Diego at the convention focused on the next-generation of biofuels beyond crop-based ethanol. Acknowledging that biofuels from food crops are both driving up the cost of food and creating greenhouse gas problems of their own, they highlighted advances in biofuels from algae and other non-food biomass. About 20,000 attended the convention. Renowned geneticist and UC San Diego alum J. Craig Venter spoke in his luncheon keynote address about how his early successes in genomics are now leading to breakthroughs in advanced biofuels through the tools and techniques of synthetic genomic research. He amplified those comments the next day in an opinion article in the San Diego Union-Tribune, where he wrote that “synthetic genomic advances offer seemingly limitless opportunity” to wean ourselves away from dependence on fossil fuels. Venter is working on advancements that use metabolic engineering and synthetic genomics to create next-generation biofuels from sugar and even carbon dioxide. The intense interest in the next-generation of biofuels was on display at a breakout session moderated by Professor B. Greg Mitchell, a research biologist at Scripps Institution of Oceanography at UC San Diego. Mitchell’s session on algae biofuels, held on the first morning of the convention, was attended by more than 300 people. It was standing-room-only as participants lined the walls of the room, while others were turned away at the door once the room was full. The panel of researchers and business leaders discussed how creating fuel from what they playfully called “pond scum” has caught the attention not only of scientists but also of venture capitalists, entrepreneurs and even oil companies. Panelists discussed how algae can be grown on non-arable land and won’t compete with the production of food crops. And, algae can be grown with salt water or brackish water so that it won’t use up fresh water resources. Algae also yield up to 10 times the biomass of land plants; so for fuel purposes, a greater amount of biomass can be produced on less land than crops. 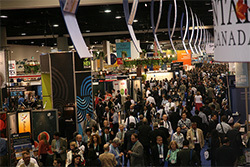 UCSD scientists gave several talks during last week's BIO 2008 convention in San Diego. Mitchell and other panelists were careful to point out that while algae-based fuel can be produced today, it’s not yet commercially viable. Much more investment is needed in basic science and engineering to complete the development of products and the economies of scale in production to refine and distribute algae fuel. All panelists—along with Venter, the geneticist —stressed the need for increased funding for research on next-generation biofuels as a critical need to advance this important solution to climate change and growing global energy problems. Another well-attended session highlighted the progress of California’s Proposition 71, the California Stem Cell Initiative. Panelists included Larry Goldstein, director of the UC San Diego Stem Cell Program and a professor in the department of cellular and molecular medicine, and Alan Trounson, president of the California Institute for Regenerative Medicine (CIRM), along with several business and research leaders. Panelists discussed how Prop. 71 has advanced basic research into disease treatment and also helped create new stem-cell companies and expand the state’s burgeoning biotech industry. In May, CIRM granted $43 million to the San Diego Consortium for Regenerative Medicine to build a center dedicated to stem cell research on the Torrey Pines Mesa. CIRM includes UC San Diego, the Burnham Institute for Medical Research, the Salk Institute for Biological Studies and The Scripps Research Institute. The consortium's planned four-story building will house about 71,300 square feet dedicated to stem cell research, including laboratories and office space. In all, 21 research teams from the four participating institutions will work in the new facility, which will be ready by July 2010.